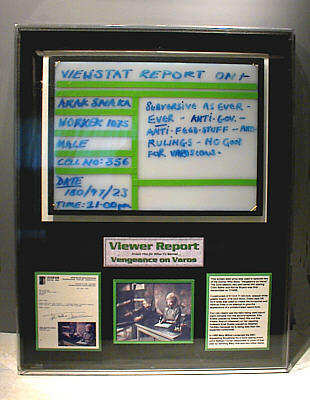 This screen seen prop was used in episode two of the Doctor Who Story "Vengeance on Varos". The 22nd season, two part serial (6V) staring Colin Baker and Nicola Bryant that was first transmitted on 1/19/85. Constructed of 8 1/2 X 11 3/4 inch, opaque white plastic board, 3/16 inch thick. Green tape 3/8 inch wide was used to create the horizontal and vertical lines in an attempt to give the appearance of a prefabricated report form. You can clearly see the item being used about eight minuets into the second episode. 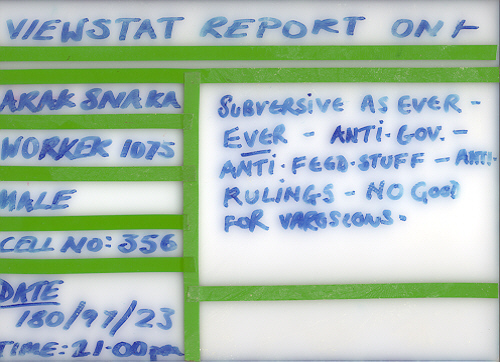 Etta Snaka (played by Sheila Reid) fills out a Viewer Report on her napping husband Arak Snaka (played by Stephen Yardley) because he is being less than the expected conformist. In 1985 Mary Milton contacted the BBC requesting donations for a fund raising event. 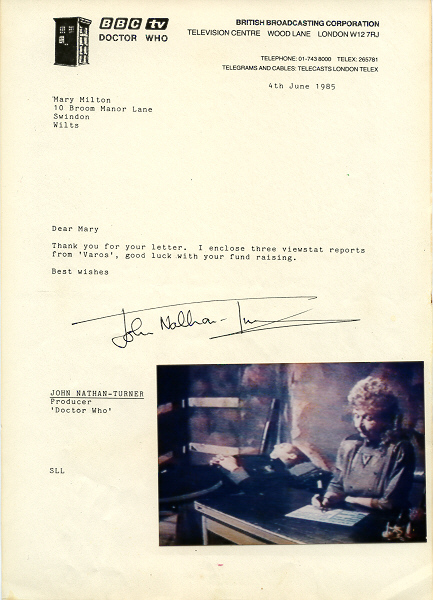 (anyone know for what) John Nathan-Turner responded in June of that year by sending Mary this and two other items. Ten years pass and in 1995 Timothy Johnson of Kent in the UK bought the Viewstat from a dealer. I acquired the prop from Timothy in April of 2001 and it now resides in my collection here in Virginia, USA. All the pictures on this page are property of www.richardwho.com and Richard Briggs or the Copyright holder unless otherwise stated. Copying, distribution, display or use of these images in anyway is not permitted without written consent from the owner.